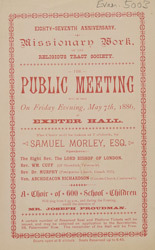 This leaflet is advertising a political meeting to be held at the Exeter Hall. This hall was a large building designed by Mr Gandy Deering as a meeting place for religious, scientific and charitable institutions. The building cost £300,000 and had two meeting rooms one capable of holding 800 people and the other considerably larger allowing 3000 people to listen to speakers. During the 1840s and 50s the halls was used by philanthropic groups such as the Ragged School Union and The Temperance Society.